What happens when a group of talented regional poets come together weekly to inspire and encourage each other in their craft? 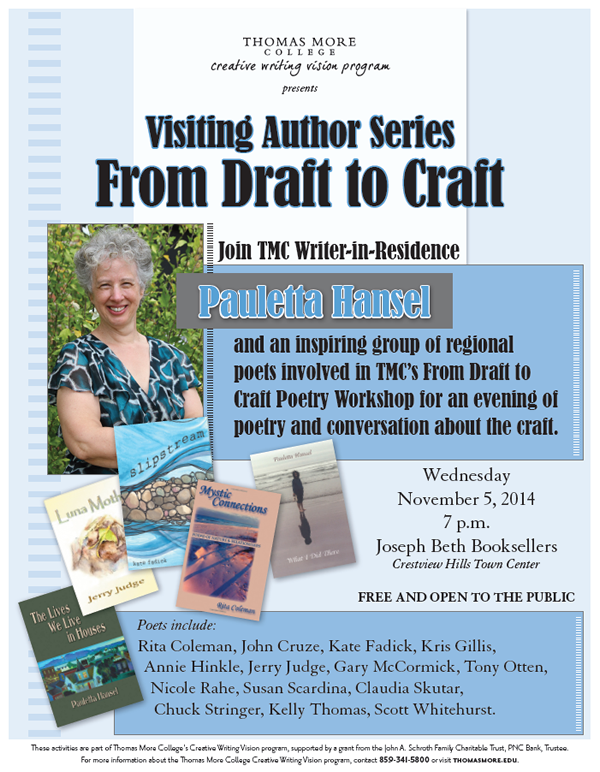 Come hear for yourself on Wednesday, November 5, 7 pm, at Joseph-Beth Booksellers/Crestview Hills (about 3 miles south of Cincinnati) as poets from Thomas More College’s From Draft to Craft Poetry Workshop, led by Writer in Residence Pauletta Hansel, read from their work and talk about their craft. I’ll be reading, along with Kate Fadick, author of Slipstream (Finishing Line Press), Pauletta Hansel, author of What I Did There (Dos Madres Press) and The Lives We Live in Houses (Wind Publications), Jerry Judge, author of Luna Moth (Finishing Line Press), John Cruze, Kris Gillis, Annie Hinkle, Gary McCormick, Tony Otten, Nicole Rahe, Susan Scardina, Claudia Skutar, Chuck Stringer, Kelly Thomas, and Scott Whitehurst. A book signing follows. TMC’s Creative Writing Vision Program is supported in part by grants from the John A. Schroth Family Charitable Trust, PNC Bank, Trustee, and Scripps Howard Foundation. 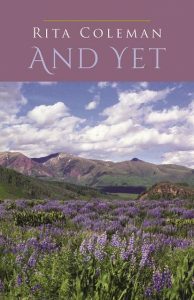 For more information about Thomas More College’s Creative Writing Vision Program, visit www.thomasmore.edu.